Building upon the success of This Side of Paradise, which won the 2001 Hal Clement Award for Best New Science Fiction Novel for Young Adults, Steven Layne has written another gripping tale featuring teens battling evil forces. 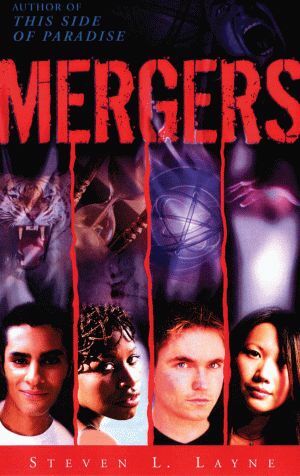 In Mergers, the sinister antagonist is the mastermind behind an engineered society that has wiped away all traces of race. He is intent on destroying Dirk and his friends, who have spent their entire lives in hiding because of their racial identities. Each has extraordinary powers—Nicci, the African Traveler, manipulates time; Mateo, the Hispanic Metamorph, alters his shape; Keiko, the Asian Empath, heals with her hands; and Dirk, the Caucasian Telepath, invades others’ minds. In this cautionary tale, the themes of loyalty, leadership, and identity are all called into question as Dirk and his friends struggle to conquer The Merger. When they take a dangerous journey into the past with the hope of restoring the world’s natural timeline, each of them must struggle with their own inadequacies and deal with all-too-human failings, despite their special powers. Mergers’ riveting plot and supernatural characters will keep teens engaged while reminding them of each individual’s potential to change the world. Award-winning author and educator Steven L. Layne serves as associate professor of literature at Judson University in Elgin, Illinois. He is a respected literacy consultant, motivational keynote speaker, and featured author at conferences and literary events worldwide. He is the author of five picture books published by Pelican, including the International Reading Association/Children’s Choices selections My Brother Dan’s Delicious and The Teachers’ Night Before Christmas, which is also one of the best-selling books in The Night Before Christmas Series. Mr. Layne is also the author of Thomas’s Sheep and the Great Geography Test and Thomas’s Sheep and the Spectacular Science Project. 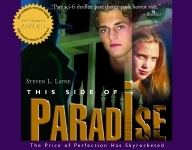 His novel This Side of Paradise won the 2001 Hal Clement Award for Young Adult Science Fiction. He has written two collections of poems praising parenthood: Verses for Dad’s Heart and Verses for Mom’s Heart. He lives with his wife and three children in Saint Charles, Illinois. Click here for Chapter 1. Click here for the Front Matter. Click here for the Mergers study guide.